The neverending debate, Marvel versus DC, seems to always be boiled down in its simplest form to an argument of light-hearted fun versus dark and brooding gloom. Peyton Reed’s Ant-Man was a huge chip in that pile, doubling down on the belief that Marvel movies are more fun by being one of the most easily enjoyable adaptations to ever hit the screen. As a huge fan of his, I hope Edgar Wright (Shaun of the Dead, Hot Fuzz) enjoyed the film despite distancing himself from it during production. He is still credited as the top screenwriter and when I first heard his name attached to the project I immediately though it had a chance to be the funniest superhero movie ever. And it may have achieved that goal even with his departure. Paul Rudd was his usual charming and subdued yet hilarious self in the titular role. Michael Douglas triumphantly returned to making movies that people see and it was nice to have essentially the wise and quirky, serious yet funny, old professor from Wonder Boys back. Rudd and Douglas carry the core of the plot but Evangeline Lilly and Michael Pena steal the show and give the film its heart. Serving as much more than a foil who eventually falls in love with the hero, Lilly’s Hope van Dyne who (spoilers!) slowly uncovers her family’s history, revealing that this movie is not just the origin of Ant-Man but of The Wasp as well. Holding this card to the end of the flick was a brilliant stroke and had me ready for the next installment in this storyline before the credits even rolled. More badass female superheroes in the MCU, please! Pena was so good that I felt guilty – nay, ashamed – for not knowing more about him. I don’t know if this is a failure of Hollywood or of me, but I need more of him in my life, especially in these kinds of roles. 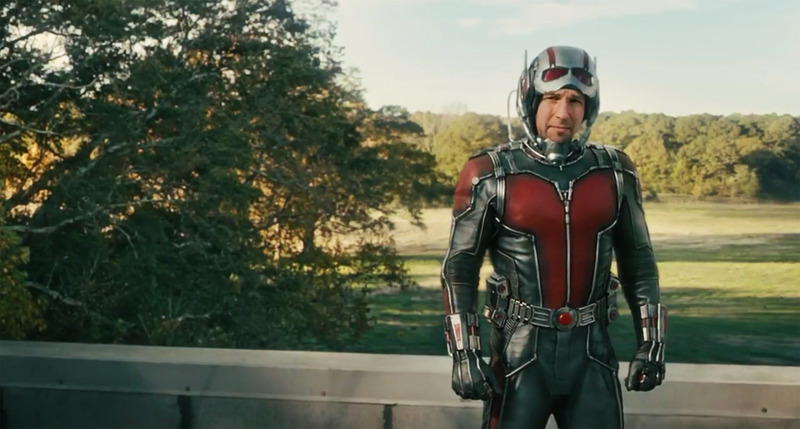 When he left the scenery of Ant-Man, it was like watching a family member you love drive away after the holidays. Come back, Michael Pena, and tell that story for another 15 minutes. The clever editing that accompanies Pena’s scenes are just indicative of the way Ant-Man is creative not just aesthetically but thematically as well. Ant-Man works so well because it is a combination of all the best aspects of Stan Lee comic books from the 70s to the 90s. It’s colorful, imaginative, quirky, clever, funny, adventurous, and still ultimately is a story about a father and his daughter that is inspirational. That’s not to say the film is bereft of more mature or complicated themes. The abuse of corporate and military power is personified magnificently by Corey Stoll’s Darren Cross. By the time Cross finally becomes (spoilers!) Yellowjacket, the film is in stride as the perfect mix of striking visuals, levity, and heart. When Scott Lang (spoilers, spoilers, spoilers!) risks disappearing forever into a subatomic realm in order to save his daughter – who he was just getting to know – my heart sank, rose, sang, and cried all at the same time. It takes truly the most hardened of cynics or an infantile inability to get over how silly the name sounds to not enjoy the wonder that is Ant-Man.